What makes an urban hero? What was it about 2Pac or Biggie? What turns them to mythical—especially when that hero has a sordid past? It might be hard to wrap your mind around how a rational person could love and admire a gang member, a street entrepreneur, an entertainer. I’d like to submit that it’s not as hard as you think. And not only do you understand already; you’ve done it too. You might not be plugged into Los Angeles hip-hop, or hip-hop as a whole, so you may have missed this. Rapper and businessman Nipsey Hussle was murdered on March 31 on the corner of Slauson and Crenshaw streets. He was shot point blank six times. If the basis of your understanding of Los Angeles urban life mostly is informed by the news or the movies, you might not have a full picture of what makes this death any different than any other tragedy of a young black man shot down in the streets. Why is all of hip-hop, along with the LA police chief, mourning his death? Rival Gangs, Christian, Black Muslim, Rastafarian, multiple races and socioeconomic groups all stopped and paid respects. New York and Houston held vigils drawing thousands. Why is this so different? Who is this Nipsey Hussle? How can rappers, gang members, and the police chief all stand in unity and mourn this man? Before you start streaming his music and write him off as just another expletive-laced rapper pushing poison into our kids’ ears, allow me to give you a primer. Born Ermias Asghedom, Nipsey is a first generation Eritrean-American, raised in South Central Los Angeles. His particular neighborhood was ruled by the street gang Rollin’ 60s Crips. Nipsey was an unabashed member of this gang. For many African American and Latina/o youth who are raised in communities of systemic brokenness (poverty, violence, etc. ), gang affiliation is a natural way of life. For many, there are no alternatives. For some, their family affiliation is 3-4 generations deep. It’s woven into the fabric of the family identity, similar to religion. To walk away is not simply a “death sentence.” It’s worse, a life of lonely banishment from their own family structure. For some, it’s making a life-altering decision at the age of 10 because they’re tired of being jumped while walking home from the corner store, playground, or school. For some, it’s about finally receiving positive affirmation from a male figure of the same ethnicity. For some, they want to wile out in their depravity. For all, it’s a way to cope with the deep saturation of hopelessness that reigns in our communities. Notice how this description bears a striking resemblance to how young Muslim men get radicalized into ISIS. I’m sure your gut wants to believe that terrorists are a special kind of evil. But honestly, they were just kids at some point. As Nipsey grew in street cred and in popularity, we begin to notice he didn’t speak like the rest of his peers. He spoke about purchasing jewelry and cars as liabilities. He was interested in buying real estate and opening businesses—mind you, this is a 19-year-old gang member. In interviews, he talked about what happens when there’s a lack of opportunity and resources. A person focuses on survival. They don’t have the margins to make moral decisions. Nipsey’s goal was to create opportunities for financial security and business ownership, so people can make different decisions. He knew this wasn’t the only solution to the problems in inner cities, but it was an important step. Nipsey’s wallet was in line with his words. He never left the city that raised him. He was committed to setting up community for long-term success. The stripmall where he was slain was not just the street corner he hustled on as a teen. Nipsey invested millions to rejuvenate that plaza. He owned it. His flagship clothing store, a Creole restaurant, a barber shop, a convenient store—all filled with local-born staff. He opened Vector 90, a coworking space, which introduces young students to the STEM fields and provides area professionals a place to grind. THIS, this, is what Preemptive Love is doing in Iraq and Syria. I know those places seem so exotic and far away. But it’s just like here. They are just like us. Nipsey’s work resonates because we have the same hopes. He did what we all hope any hometown boy who hits it big would do. He owned his business; he handed business to others. When he died, Nipsey was in the process of working with the Los Angeles police chief on how to cultivate better relations between the LAPD and young people of color. 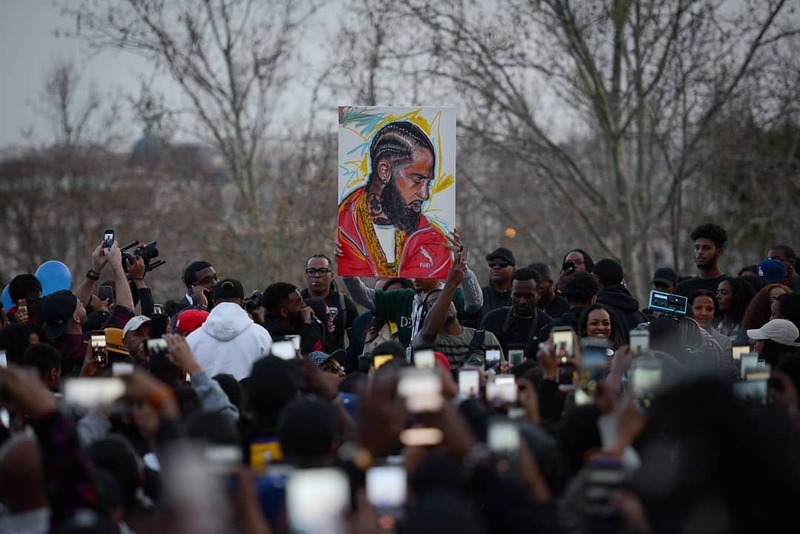 Vigil held in Nipsey’s stripmall. Photo by Jason Petty. I met a homeless man who said that Nipsey’s businesses paid him a couple hundred dollars a week to just to come sweep the sidewalks and driveways. While his legacy is amazing, the deepest part of this tragedy comes in the form of who actually killed him. It’s a known fact that when you’re involved in gang life and make a life change, the wisest thing to do is to move out, because otherwise your life is going to be taken by someone you know—and it’s probably going to happen in the same neighborhood you work in. I have to pause for a second to ask myself: am I willing to match the commitment of a known gang member to being a change agent? Are you? Knowing full well what your end might be? Nipsey’s commitment to seeing change in his own neighborhood made him willing to stay. His reputation inspired all around him. His hard-earned street cred made him a trusted voice. This combo moved him from common rapper to a hero. Which one of us can’t understand the idea of a person being more than one thing? A person laying their life down for the advancement of others? My Bible says that love covers a multitude of sins, and I’m positive when you recognize the love in a person, despite the mistakes they made, when you see the redemption in their actions and words—it’s hard not to cheer them on. You would be very hard pressed to find a person you idolize who hasn’t had to reckon with choices they’ve made, and pay it forward. What you and me and the hood have in common is that we have no choice but to honor the honorable. A person who lives by a code that says the success of others is tied to ours—when I win, we all win. It was hard to not cheer for Nipsey.